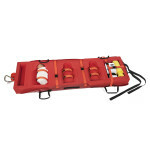 Med Sled® Storage Device that can store sleds out of the way and in one Known location. All storage bag cases come with hook loops for installation along walls. 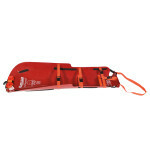 Made of a durable canvas to protect the sled from contamination and has a protective pocket for any evacuation plans. 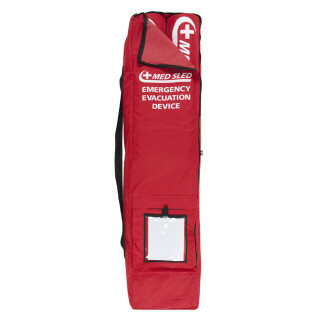 Med Sled® Storage Devices have been designed out of a very Durable Canvas. 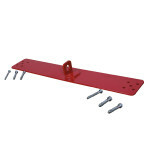 This storage device has loops placed along the top and side for any form of installation you need, whether that is vertical or horizontal. 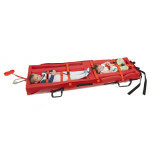 Keep your Med Sled® sleds out of the way when not needed but within the reach of any trained professional. More than 3,500 facilities have chosen and deployed over 50,000 sleds across the United States. All 3,500 facilities have used our storage devices in some form to keep and protect their device safe and stored away in a designated area. Med Sled® sleds were developed with storage in mind. Our standard sled rolls up into a 10″ circumference and is easy to store in any of our storage devices. Don’t worry about storage when it comes to evacuation. Up to four (4) MS36 sleds stacked vertically (2 on top of 2). Equipped with a front pocket and visible pouch for equipment and unit evacuation plan, Includes wall hook loops for vertical or horizontal installation, Includes shoulder straps for convenient transportation, Made of durable Canvas that protects products from contamination.